Dr. William E. Dunn, the son of John and Jane (Horine) Dunn was born in Elkton, South Dakota on July 22, 1921. 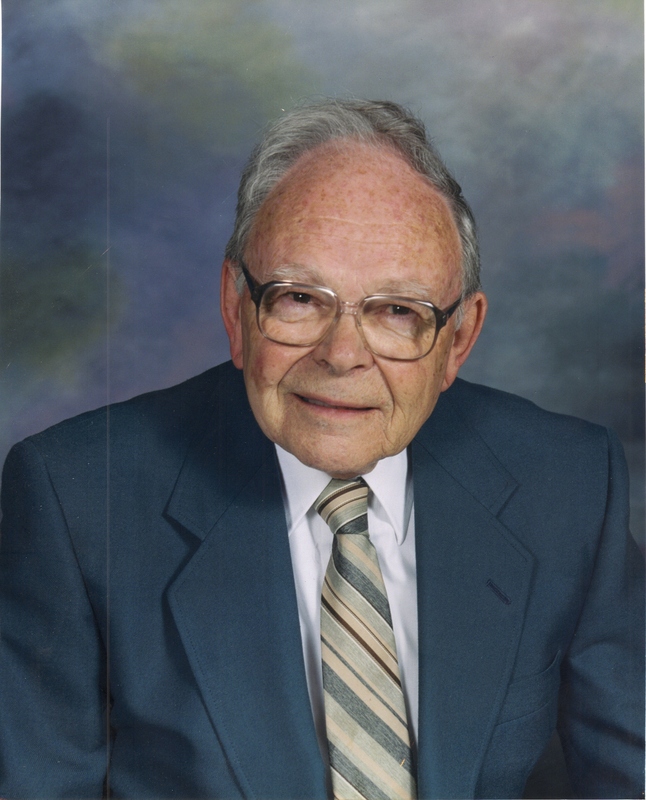 After graduation from Elkton High School he attended St John's University in Collegeville, Minnesota and Creighton University School of Dentistry, graduating in December 1943. He entered the U. S Navy Dental Corps and served from 1944 to 1946 with rank of Lieutenant. He married Charlotte Walsh in Greeley, Nebraska on September 22, 1948. The couple had six children, James (Polly) of State College, Pa; Tom of Lyons, SD; Catherine (Terry) Crandall of Yankton'; Patrick (Nancy) of Dell Rapids; Maureen (Bob) Pay of Sioux Falls; and Mike (Deb) of Richmond, VA. They had ten grandchildren. Charlotte died June 25th, 1999. Paul Self of Sioux Falls was a de facto family member. Bill is also survived by his brother Dr. John (Jean) Dunn of San Antonio, Texas. He practiced dentistry in Greeley, Nebraska for two years and moved to Sioux Falls in 1948, where he practiced for 42 years. He was active in the South Dakota Dental Association holding all of the elective offices including President and Secretary. He was privileged to have served in several capacities at the American Dental Association including a seat on the floor of the House of Delegates. He served as editor of the state dental journal and wrote the history of the South Dakota Dental Association. He chaired committees which revised the constitution and by-laws of both his district and state associations. As state president he, along with other dentists successfully lobbied at the state legislature to preserve the Mandatory Fluoridation Bill which required all communities over 500 to fluoridate their municipal water supplies. This legislation caused a marked improvement in the dental health of the public with many children becoming completely free of dental decay. As dental representative on the Sioux Falls Headstart Committee he instituted a tooth-brushing program which was so successful that it was adopted by all eight states in the Denver Region. He served as a member of the Alumni Advisory Committee of Creighton University. He was appointed by Governor Kneip to the Emergency Health Services Committee and also served on the Health Professions Loan Committee at the State Capital. He was a Fellow of The American College of Dentists and the International College of Dentists and was state chairman of the Pierre Fauchard Society, an honorary organization. He was formerly on the medical-dental staff at McKennan Hospital and was a former member of the Morning Optimists and the Marquette Toastmasters. He was listed in â€˜Who's Who in the Midwest." Governor Kneip appointed him as "Ambassador of South Dakota," and Sioux Falls Mayor Jack White declared the day of his retirement as "William Dunn Day". He was a charter member of St Mary's Church, having sung for 60 years in the choir since its inception. He was also a member of the funeral choir. He was a member of the "Just Because" quartet which entertained at Cathedral Capers, Feathers and Follies, and at nursing homes throughout the area. He also sang in the American Legion chorus and the symphony chorus. He wrote a series of articles entitled "Elkton's Main Street, 1900 to 1950" that were published in the "Elkton Record". Bill enjoyed writing, especially articles from his life experiences and memories and shared many of his articles with friends and family. He had a life-long interest in the weather, history, geography, and nature. Although many in South Dakota talk about the weather, he was a particular weather fan. Once it became available, his favorite station was the Weather Channel. He passed along his fascination with plate tectonics to at least two of his grandsons. He genuinely liked people and was quick to speak to strangers. He believed that everyone in South Dakota has something in common and when he met someone he worked to discover what it was. This was made easier by his ability to remember people and details about them. People were often amazed by his phenomenal memory for detail. If you wanted to know the names of all the barracks at Great Lakes Naval Base during World War II, the exact height of Harney Peak, the exact street addresses of people that lived in the north end of Sioux Falls 60 years ago or where the sun would shine on the wall of St. Mary Church on a particular day of the year, Bill was your man. Visitation will be Wednesday at 5 PM at St. Mary Church with a Scripture Vigil at 7 PM. Mass of Christian Burial will be Thursday, 10 AM at St. Mary Church with burial to follow at St. Michael Cemetery with Full Military Rites by Veterans of Foreign Wars Post #628.